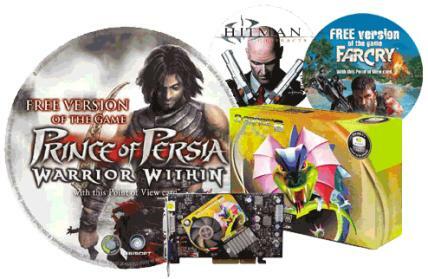 EINDHOVEN – 15 December, 2004 – POINT OF VIEW®, a European manufacturer of Graphic Cards announced today its latest product bundle. The Point of View GeForce ™ 6600GT AGP will be available from today in a special edition bundle with the award winning games „Prince of Persia: Warrior Within“, „Farcry“ and „Hitman: Contracts“. 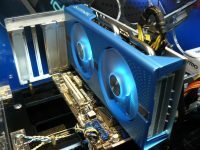 The Point of View GeForce 6600 GT AGP will be running on a coreclock of 500MHz and will have 128MB DDR3 running on a Memory Data Rate of 900MHz. Needless to say that this board will support Microsoft DirectX 9.0 Shader Model 3.0 and a superscalar architecture for unprecedented performance. Just the graphical superiority you’ll be needing to get these excellent games in acceleration. Please watch the stickers on the box to make sure you’ll buy the right package! The bundles are expected to be available in week 52.